From the Northtowns to the Southtowns, give your home a face-lift & boost your property value with a kitchen remodel! The kitchen is the heart of any home and the epicenter of activity. It’s where meals are prepared and families gather, and for many, the design and functionality of the kitchen alone can have a significant influence on how they feel about the entire home. If you want to increase your home’s overall appeal and value prior to sale or simply want to make upgrades so you can enjoy it yourself, start with a kitchen remodel. There is no mistake that a kitchen renovation is a smart investment both for your family’s present and your home’s future. 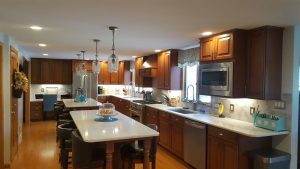 With a team of experienced kitchen remodeling contractors behind us who have been serving the WNY suburbs for years, 3 G Construction Inc. of WNY is the obvious choice for all your remodeling needs. We work with homeowners across the Southtowns and Northtowns looking to improve the appearance and functionality of their kitchens and would be happy to sit with you and discuss various options for your upcoming project. Our kitchen remodeling contractors work with you throughout the entire process. We emphasize functionality as well as beauty to ensure everything will work well for you. We change as much or as little as you need, including altering cabinet layouts, completely gutting a space, or making cosmetic adjustments. We install cabinets, flooring, backsplashes, lighting, and even new paint ourselves. We promise to complete the work as efficiently as possible, so you’ll have your kitchen back as soon as possible. We strive to provide our clients with the best value and service for their kitchen remodeling project. 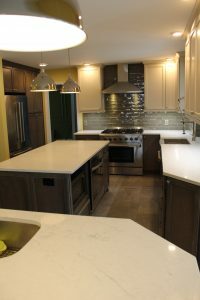 Investing in a kitchen renovation is a big decision, and we are committed to helping you realize your dream kitchen using quality materials, workmanship, and service. Our kitchen remodeling services extend to those in Eden and East Aurora, all the way to Clarence and Lockport. Simply give us a call at 716-550-0659 to inquire about a free estimate and we will send a contractor out to whatever suburb you call home!